At about 12pm on 25th April 1916, while Irish volunteers advanced on the GPO, a group of Irish Citizen Army officers approached the gate of Dublin Castle. A lone policeman on duty, James O’Brien, told them to disperse and was shot by the ICA officer in charge, Sean Connolly, thereby becoming the first casualty of the Rising. Believing British soldiers to be within, the ICA withdrew to the adjacent City Hall. Connolly became one of the first rebel casualties due to sniper fire. The rebels held out until Tuesday and then surrendered. Dr Kathleen Lynn, who assumed a commanding role after Connolly’s death, wrote of events a few days later: ‘Easter Monday. Revolution. Emer & I in City Hall. Sean Connolly shot quite early in evening. All women taken to Ship St. about 8:30. 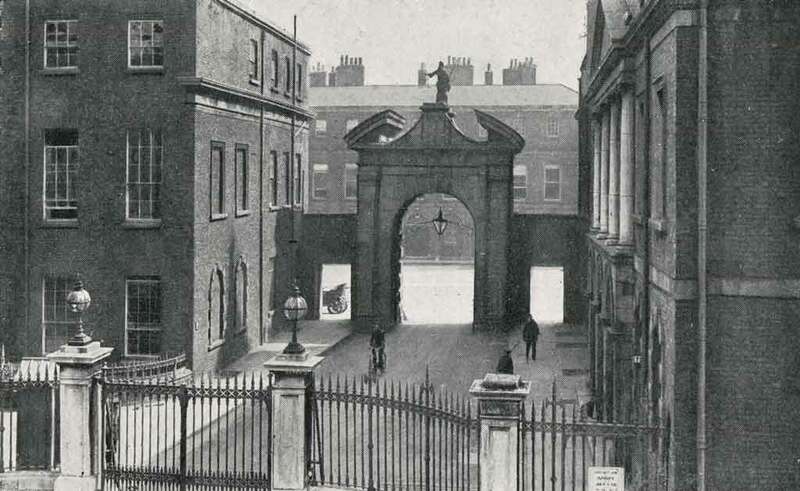 Dublin Castle was also used as a military hospital for the wounded during and after Easter Week.